Get ready to blast off! This Space Shuttle Craft is an easy project for any space enthusiast. If you don't have a paper towel roll just roll up a piece of white construction paper! 1. Paint your paper towel roll white and cut a white triangle from your cardstock. 2. Crumple up a small piece of black construction paper and stick it in the top of the roll. It should stay in pretty well by itself, but glue it in if you want extra stability. With your markers write the name of your rocket ship on the side of your roll. 3. Glue strips of red paper onto the bottom of your roll to make the engine fire. 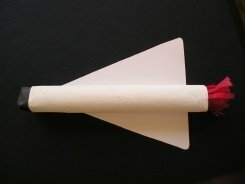 Glue the roll to the triangle, and you're ready to blast off!